Twice a week, I do the Indian woman thing, and luxuriate in Ayurvedic oils seeping into my scalp. I don’t really enjoy the sensation, but it is an effective and gentle means of addressing finicky hair concerns, as we all know. So while my scalp marinates, and I fold laundry, make beds, iron clothes, and generally complete the mummy persona, I tend to start thinking about self care in a larger context. It’s nice to read widely disseminated writings about self care that view it as more than just spa type activities, though I will admit that while I am writing this, I am enjoying a beautiful candle in a glass jar. Few of us are immune to the pull of the senses! And if we cannot find the time to roam in pine forests or cough up the money to travel to warm beaches, then candles and iTunes and walks in the suburban wilds will have to replenish us, no? These and other similar pursuits can be a balm, even if falsely deemed mock worthy. They are not vapid, and they do not diminish us, nor do they detract from more big picture changes we may need to make. In fact, I find that the charges of vapidity do a poor job of concealing the sexism that underlies the inherent contradictions in how women are both targeted as a consumer group for R&R pursuits, yet ridiculed for conforming to gender type. Sybarites must be inherently lazy, pleasure seeking, anti intellectual fools, after all! And many women buy into the fear of being typecast—“oh, I’d rather rock climb, or read The Economist, or administer vaccines to rural, indigent babies”—when really, if we are going to attract snark no matter how we express ourselves, we might just as well do what brings us happiness (which could be rock climbing, etc!). I do think we must ask ourselves if our choices cause economic exploitation, environmental degradation, and/or cultural appropriation, but that is a thesis for another day. Our society shamelessly cuts off women’s inherent right to fair wages, free time that is not about cooking and cleaning, and patriarchy-free access to public spaces, but hey, let’s also dismiss them for creating simple pleasures with their limited resources. God. 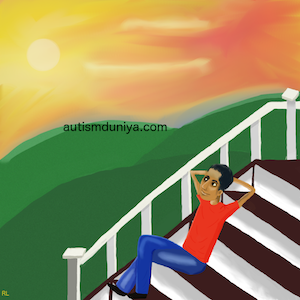 In our autism family, we all gravitate by necessity to sensory self care. The kids do it by decompressing in their rooms so they can step back from the overload of being around other people all day. R and I sometimes lie in his room and talk over whatever flits into our minds. I like to think of his bed as the Ship of Desensitization, on which we set sail, unmooring ourselves from the shores of ‘should’ and drifting away into the tidal pull of ‘what we really are.’ A looks at photos on our phones, using the images of past events to reframe the jumble of impressions he formed when he was in the thick of it, asking us to repeat narratives that help him caption each picture, and thus arriving at his own feeling of rightness. He is such a classic autist in so many ways; the amount of sorting that goes on in that noggin would fry my synapses utterly. Self care in households like ours is an amorphous thing. It can be falling into a much needed state of torpor after days of screaming and high risk behaviors, and when we finally get a day of quiet, we have nothing but fumes to emit. It’s going to the gym even when we cannot people anymore. It’s finally saying ‘enough’ to autism’s insistence on sameness, and getting rid of things that should have been gone two years ago (this can cause another round of screaming, but it’s worth it because you saved your family from an appearance on Hoarders). It’s going to support groups, if that’s what helps. It’s learning financial planning to accommodate a child who may never need you less. It’s autistic and non-autistic people doing whatever they must to create safe spaces that, even if we don’t understand, we must endeavor to respect. Letting autistic people stim. Letting parents finish a thought. Everyone eating whatever settles their stomachs. Not tripping one another up. Allowing each person to at least partially meet life goals. And finally, self care is not pretending to agree with social norms that define our circumstances: mom pedestals to laud our wretched sacrifices that should not be necessary. Peddling of holistic cures for our kids. Charitable band aids to patch over the paucity of autism services infrastructure. Shaming us for not shouldering each difficulty with a more cheery spirit. Comparing us to other families who do it better. Holding up as examples the deeply accomplished autists at the expense of quietly average ones. None of these things serves us, so they must go. Most crucially, self care is finding ways to occupy the world more wholly. More than just survival. Infinitely more than being autism role models. Releasing our hearts and senses to whisper back at us, See, I am free after all. I really enjoyed this post. Thank you for sharing.